Every summer I spend so much time thinking about how I am going to decorate my music room for the year. I spend hours (probably days or weeks) on Pinterest scouring through music bulletin board pictures and classroom organization idea. I loved my room design and bulletin boards this year. I kind of went with a bird theme! Click on the picture above to see my MUSIC room rules posters and songs in my store. Click here for bulletin board cut outs, lettering counts, and instructions. Have you ever day a great idea for your music room decor, but just don't have the time or know how or resources to put it together? Well next year may be your lucky year. 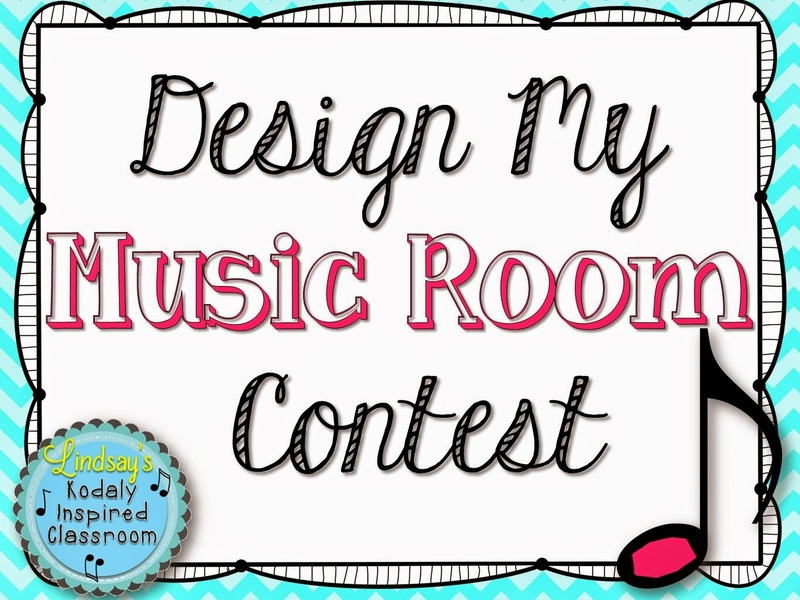 I am so excited to announce a "Design My Music Room Contest! A few lucky people will receive a music classroom kit (bulletin board layouts, letter counts, posters, instrument labels, solfege hand signs, anything you can think of that you need to decorate your room) designed by yours truly absolutely free! 1) Room theme- choose a theme for your room. It could be based off a quote like mine was this year ("The woods would be very silent..."- don't choose this or birds since that was my theme from last year! ), or it could be a more generic theme like "Soaring High in Music", "Wild About Music", the list goes on. 3) List any other room decor that you would want included in this kit besides bulletin boards. (MUSIC class rules with your theme, schedule cards, hand sign posters, lesson planner cover, dynamics posters, instrument labels, inspirational posters- SERIOUSLY, include anything you need to decorate your room- that I am capable of!). 4) Leave your email address so that if I chose to create your music room design, I can send you a free copy! Selection will mostly be based on whether I can find good clip art to suit the project and whether I feel excited and inspired by it. I am not sure at this time how many winners will be selected. It all depends on the number of entries and the time I have available to work on them over the summer. If you enter, please read through any other entries to make sure that your idea hasn't already been said. If two ideas are really similar, the free file will go to the first teacher that left the comment. Ooohhh...it would be so cool to have you design something! One of my professional development goals next year is to focus on making those connections to all those cultures that make up my school. It also allows a wonderful opportunity engage in conversations with students from other cultures and have those kids bring in a song that is specific to their family. (We have several pockets of sub cultures in my school) It is something that is done all the time with music just by the very nature of our subject (we’re cool like that)--- I’ve just never showcased it on my walls. Your creativity could really make this come to life ! b. My Music Makes Me Feel---and then a whole bunch of ways music makes you feel or how it connects you with other people/cultures. Some sort of student created blurb (emoticon?). So it's not just something I put up, but has student input. c. Games Songs—Use the map to showcase game/circle/jump rope songs in the same manner as above. 3) List any other room decor that you would want included in this kit besides bulletin boards. Maybe culture based game song posters? Kind of like an anchor chart for game songs from different cultures? Thank you for the consideration!! I think this is a really important idea/theme because I want to show to the staff and admin that MUSIC MATTERS. I think kids and adults alike would stop to read the information. Singing at a nursing home, singing to a baby (or a baby in utero), singing at celebrations, etc. It could also show careers in music like music therapy, rock/pop star, music teacher, music producer, broadway performers, etc. I would like the same things that the previous person listed, but I would also like posters for Stations (maybe numbered papers or titles of stations - smart board station, iPad station, etc) and any ideas for recorders or chorus signage. I know this isn't the best idea when it comes to using dynamic clip art, but I think it's an important theme, so hopefully you're more visually creative than I am! b.) Starry (or Spacey) Solfege. Almost a Solfa Street bulletin board, but instead of houses on a street maybe stars or planets. 3.) MUSIC rules, dynamics posters, a greeting sign for my front door, and instrument labels. Schedule cards would be cool too! 1) Room theme- choose a theme for your room. 2) Bulletin Board 1 - "Cast your spell with solfege!" - different solfege patterns on a bulletin board (can be on the staff or with just the words of the solfege) that students can decipher. Bulletin Board 2: To match with the house sorting: "The sorting" - will have the house placards (house bach, house mozart, house beethoven) as well as lists of classes that belong with each house. 3) Saw this idea on another board (can't remember exactly where) - but next year I will be splitting my classes into "Houses." There will be House Bach, House Mozart, and House Beethoven. We will earn points through good behavior, correct answers, participation, going above and beyond, etc. Randomly I'll decide a day to reward the students in the house with the highest amount of points (the classes in House Bach for example could choose a free music day - play a music game of their choice). So I was thinking really cool "House Placards" with "House Bach" "House Beethoven" and "House Mozart," My music rules all harry pottered, a greeting for my classroom stating something like "Music is Magic" and an exit sign stating "Mischief Managed" or something of the sort. that is the "house" idea. I saw this a few weeks ago and just died - I really want to try it with my students. I had been thinking about that quote, and I had posted that "houses" thing on my page a few weeks ago.Neat ideas! I used your music rules and bird line/space bulletin board this year and absolutely loved them! 1. Theme - Something along the lines of "Music is a treasure" or "Get hooked on music." Think an undersea theme with treasure chests, fish (I already have a Finding Nemo themed choir bulletin board idea), octopi, crabs, shells, etc. 2. I definitely want one bulletin board to focus on notes on the staff. Maybe with bubbles coming from a whale that trail out on the staff. I have a reward bulletin board by my door that I use as part of our PBIS program. Right now it's a monopoly board and we roll a big die at the end of class to see how far their piece will move, but I think it could be cool as a treasure map that students have to follow until they reach the reward (X marks the spot) at the end. Thank you for your consideration! I can't wait to see what you come up with, regardless of who it's for! Featuring: electric guitars, drum sets, stars, rock star kids, rockin' music notes, etc. Aside from a bulletin board set, a welcome sign (like Mrs. Bates' ROCKIN' Music Class) would be great, anchor charts (especially note/rest names and values), rhythm cards, solfege cards, instrument labels, posters, MUSIC rules, and anything else that would make Music class a ROCKIN' place to be! "Often when you think you're at the end of something, you're at the beginning of something else." 2) Come up with two bulletin board ideas/headings: Obviously, music/solfa street would be a must. Also, I read a story every class period, and so I think a board with the theme of a neighborhood (story corner) of make believe would be clever. I’m picturing posters with key critical thinking phrases like “I notice,” “I hear,” “I predict,” “I wonder,” “I speculate” to foster deeper levels of thinking during story time. Finally, the last bulletin board idea I have is in connection to creating hopes and dreams at the beginning of the year. I have every student in school create a hope and dream for music class (drawn for k-1 and written for 2-5). I’m imagining trolley cut outs for students to write/draw on; I think a trolley would be especially meaningful not only for its connection to Mister Rogers’ Neighborhood, but to visually show how we are connected at school and help each other to succeed. MUSIC class rules (possibly with clip art of people who help us/keep us safe- police, doctors, firefighters...), Instrument labels, the new music standards, inspirational posters, cabinet/storage labels (white board markers, crayons, colored pencils, etc. ), lesson planner cover… honestly, I can’t tell you how much I would appreciate anything made by you! 1. I am planning on using a rainbow theme of some sorts for next year. My classroom is already so colorful, from borders to ribbon wands, books, etc. I'm either going to go with "7 colors make a rainbow, 7 chords make music and 7 beautiful letters make us friends." or "Walk on a rainbow trail; walk on a trail of song and all about you will be beauty." as a quote decoration. 3. Welcome signs (1 for primary entrance, 1 for intermediate entrance), desk sign with my name, MUSIC rules, handsign cards/posters, melody street if possible?, 4 voices signs, positive posters and/or quotes, revised national standards posters, duet/solo/trio/quartet signs, numbered center signs, rest area, behavior charts (1 for primary, 1 for intermediate) and solfa dojo ...this is something new I'm starting next year to improve solfege & sight reading so I'm not really sure how I am going to go about it yet, but I am always up for suggestions. I am getting a brand new music room next year in our NEW school! It’s beyond exciting! Also, our school is becoming a Leader in Me school and the arts will play a huge role in it. I would love to have a slam-dunk theme to make a statement for the new school, Leader in Me, and MUSIC! a. I think this quote is perfect for music class, but it also reinforces ideas of the Leader in Me Habits. Thank you for considering my theme! I hope it inspires you as it does me. I am excited to see what you create – even if it’s not mine! Happy Summer! I've just discovered your blog today and I am so excited! I teach Elementary Music in Georgia. I'm always looking for new ideas and yours are wonderful....and SO CUTE! My school has a Reading theme each year and next year is "Fairy Tales". This can be anything from Castles and Princesses to The Wizard of Oz. 2. Two bulletin board ideas: Original creative ideas are hard for me! Maybe a solfege board - Yellow brick road? A dragon breathing fire with a staff in the fire? Thanks for creating this contest! I can't wait to see which theme you choose! I love this idea! However if I don't get to it, I DO have a Wizard of Oz themed bulletin board set that is perfect for a small board, side of a file cabinet or door. We'll see what all I have time for! Thanks for entering and I am so glad you have found my blog! Oh, Lindsay! This is very exciting! Thank you so much for offering this contest! 1) Theme - Narrowing it down to just one theme is pretty hard. There are several I am considering for next year but I think you could do wonderful things with a nautical theme. "Sailing to Success" is our school's theme, plus I love anything nautical, not necessarily "under the sea" which someone else already took. But sailboats, anchors, and pelicans or seagulls would be cute. a. Word Wall words and headers - headers would be Tempo, Dynamics, Music Genres, Articulation, Notation, Form, etc. c. General vocabulary with brief definitions that might not fall under a word wall heading - for example: melody - the main tune of a song, note = sound, rest = silence, phrase - a musical sentence, etc. The list could go on and on! I'd be happy with whatever you come up with! Thank you so much for considering my idea!! This year I expanded on a theme I found at: http://www.pianimation.com/2013/08/24/shoot-for-the-stars-visual-syllabus-incentive-program/ It worked so well I'm going to do it another year, but dig in a little deeper. I have started using Freddie the Frog in my class and my students LOVE it! I have been using little frog-themed items such as awards for student of the day, books we read in class, etc. 1. I would love to do a full pond/frog theme. 2. Some bulletin board ideas: "toadally" awesome instruments, "If you're hoppy and you know it sing a song" (maybe a solfege-centered idea), "Jump into music" (maybe careers, or things we 'love' about music?). 3. things I use daily in my class are student of the day reward certificates, solfege hand signs, Rules that spell 'music' (my rules can change, I don't have anything out of the ordinary), anchor charts would be great for all of the basic concepts we use everyday (I use ta, titi, etc. ), composer corner, recorder center, center ideas with the frog theme for younger ages, I would love to set up a listening center for this year and other individual destinations around the room. My room is huge and I have TONS of space which can sometimes be overwhelming. Anything you can come up with, I'm sure, will be great! I'd love some sort of swamp theme! We are doing the Freddie the Frog musical for my chorus kids and one of my schools is the "gators" so it would fit! 2) Music is "Toadally" awesome! If You're Hoppy and You Know It.....Sing a Song!